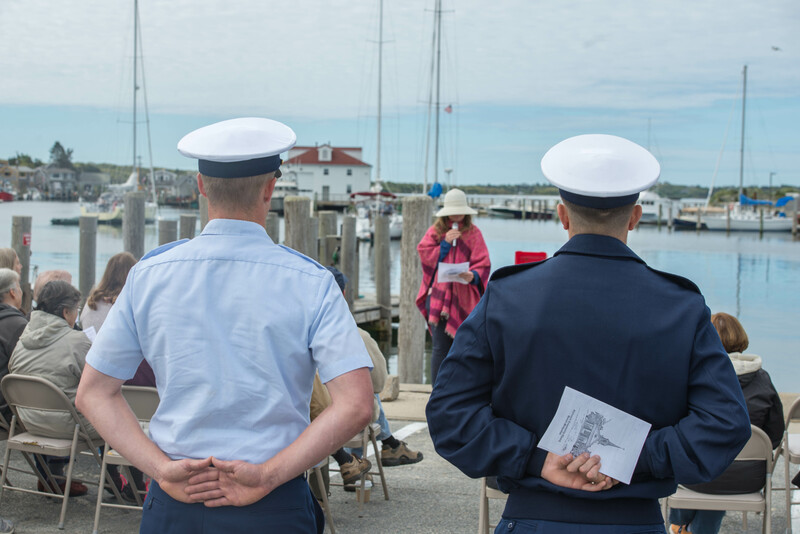 Coast Guardsmen stand at attention for annual blessing of the fleet in Menemsha Sunday. The sun peeked through the clouds in Menemsha harbor early on Sunday, as though encouraged by the voices of the Chilmark Community Church singing the hymn Morning Has Broken. The atypical venue for the service was part of an annual tradition, the blessing of the fleet. The blessing, which has its roots in the Catholic tradition, began in coastal communities in southern Europe where seafaring was a risky but integral element of daily life. Centuries later, the tradition was imported to Chilmark by pastor emeritus Arlene Bodge. The Rev. Vicky Hanjian noted that the service was more than just a continuation of habit. “Why do we do this? What good does it do to leave our comfort zones early on a Sunday morning and come to the water’s edge?” she said. 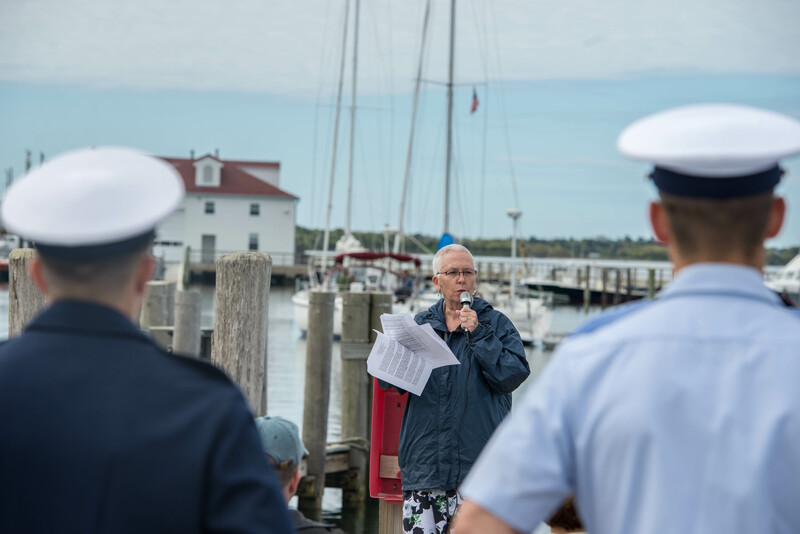 While the blessing of the fleet is intended to protect fishermen, maritime enthusiasts and those who serve our country on the water, “evoking a blessing does more than that. When we bless, we open channels of grace, we become channels of grace, and our own lives become larger and more generous,” Reverend Hanjian said. She suggested that in this sense, the importance of the tradition lies in the act of blessing itself. 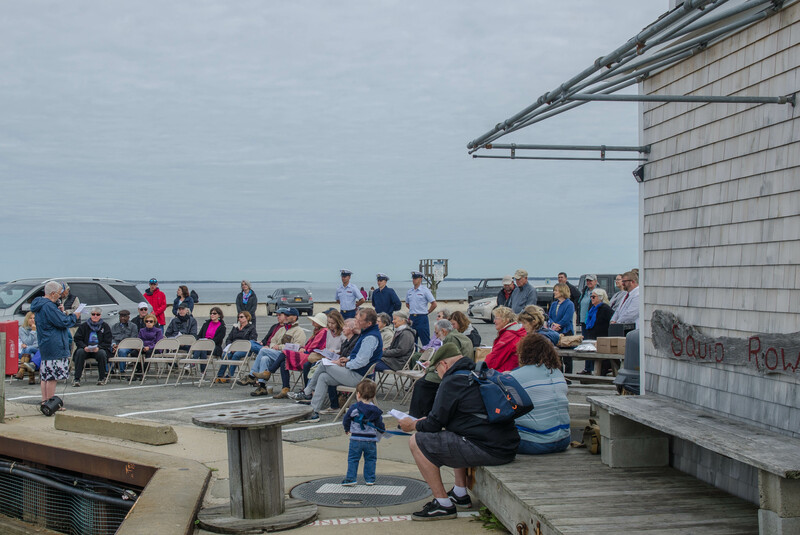 The congregation then blessed the fleet and Claire Ganz named the captains and vessels in Menemsha harbor. By the end of the service, as Anthony Peak played a postlude on the bagpipes, the sun had fully emerged from behind the clouds. The Menemsha beach parking lot was radiant.